*Welcome to our Super Mario Party Unlockables Guide. It is a work in progress so if you know something that has not been posted here yet or if something needs correcting, please feel free to submit your tips to contact@miketendo64.com. Super Mario Party is now out on Nintendo Switch. 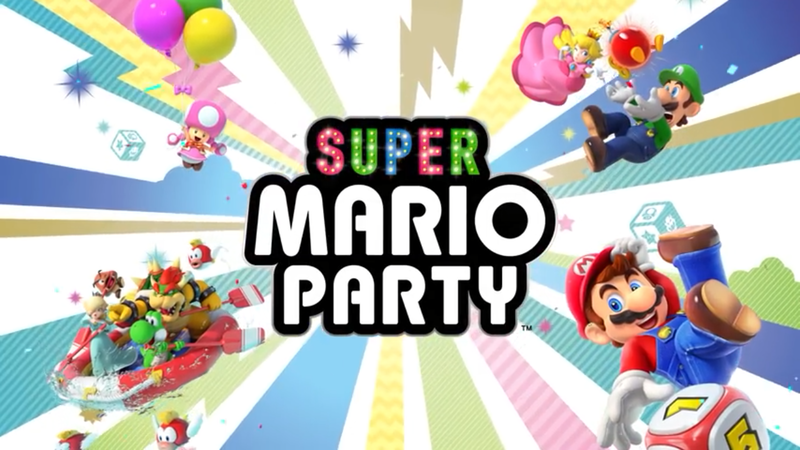 It is packed full of games modes and more characters than any other Mario Party Game. Some of the characters, game modes and features are not available from the start so you have to unlock them. We have put together this Super Mario Party Unlockables Guide to help you get the most out of Super Mario Party. Finish a game of Mario Party. It doesn’t matter if you don’t win, it will be unlocked immediately after. Clear all three stages in Mario Party. Clear all three stages in Partner Party. There are a total of four characters to unlock. You have to meet certain requirements first and then talk to them on the plaza in front of the Super Star to effectively unlock them. Donkey Kong – Clear three different course in River Suvival. Collect all five gems by clearing stages. You can find our Gem Guide here. Unlock music by playing through the game. Talk to Toad to update your Power Pad. Eventually, he will unlock Music. Additional Music must be purchase with Power Points. To unlock this feature, play through the game naturally and earn Party Points. Talk to the Toad that gave you the Party Pad and he will unlock this feature for you. You can use points that you have accumulated to buy items like stickers and music. You will also be able to use amiibo as well. To unlock the Sticker Room, you have to unlock the Party Point Feature. Afterwards, go to the Red Pipe on the left side of the plaza and Kamek will get rid of the Piranha plant so you can access the Sticker Room. Once you have the Party Point Feature, you must visit the Sticker Room at least once. Talk to Toad again and he will now let you buy Stickers in exchange for Party Points. Talk to Birdo after gaining access to Stickers. She will allow you to participate in the Super Mario Party quiz for chance to win stickers. Not so much an unlockable but they can certainly change the tide of success in Mario Part and Partner Party. After finishing Mario Party and Partner Party, there are a total of two more stars up for grabs. They are randomized but we have listed what ones we have come across so far so you know what to look out for. There is a Master Mode in Challenge Road once you complete Challenge Road once through. There is a master mode in Challenge Road after completing it once. Thank you for letting us know. We shall include these tips as soon as. How would you like to be credited? Is Aleksar okay? The Master AI unlock doesn’t require getting all the gems. I’ve only got two gems and just unlocked the Master AI. I had just unlocked Pom Pom, so maybe it’s something to do with Challenge Road? Thanks for letting us know. We can amend it now. You can unlock Hard Mode in River Survival by reaching all 5 end goals and going down every path. And you can also unlock a gold oar by speaking to birdo and answering a question though im not sure what triggers the question. Thank you so much James for your input. We will add these into our guide. How would you like to be credited? Another Ally bonus is for when you had the “perfect match” Ally. Someone playing Hammer Bro got the bonus for having Yoshi as an Ally even though he did not have the most allies that game. Thanks for letting us know. There are two types of Ally bonuses. One is for most allies, the other is for the perfect match, like you said.